This is me in high school circa 2003 when I was year twelve. It could have been the 70's for the way I dressed. 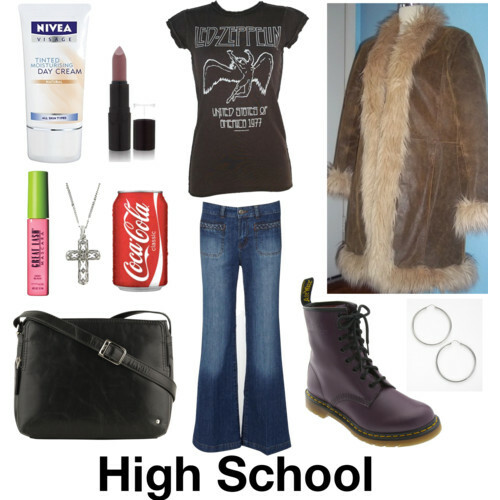 I saved up to buy a coat very similar to that below and I loved my band shirts especially Led Zeppelin. My favourite shoes were my purple Docs that I bought with my birthday money when I was 14. Unfortunately they are no longer with us but mum bought me some maroon ones for something like $20 at an Op Shop. I loved flares and my bags were all across the body. I loved wearing lipstick (which I now hate) and wore tinted moisturiser instead of foundation. I loved eyeshadow but never left the house without mascara. I love crosses even though I'm not religious so always wore a cross. I also loved big hoop earrings especially if my wrist could fit through them. I always drank coke, either a bottle from the canteen or a can from the vending machine. My fashion really hasn't changed that much from then. Today I sit here in jeans, a Doors shirt, flat black shoes and a blue flanno. Still the same Ames. Very cool Ames... i always wanted a pair of Docs but could never afford them! The coat is a little scary ;) I love your t-shirt though!! Haha my coat isn't leather thank goodness. It is warm though! I love it all - i'm not sure about that coat though... it better be fake fur! I had fake DOCs at school but bought my first pair with my first pay check.